Experience real adventure in the scenic, historic New River Gorge National Park in West Virginia. Discover amazing whitewater, rock climbing, mountain biking, ATV touring, horseback riding and more. Let River Expeditions host your trip for memories that last a lifetime – make it an all-inclusive vacation package with lodging, meals and adventures and attractions. Book online and save! River Expeditions is the new home of Rivers Resort, Appalachian Wildwaters, Extreme Expeditions, USA Raft and Rock-N-Roll Rafting. With over 70 years of combined rafting experience since 1972 and the collective resources of five professional outfitters coming together, guests of River Expeditions benefit from high quality adventures and unmatched service, both on and off the river. 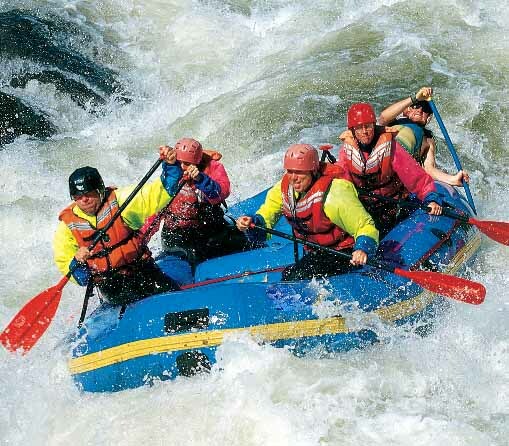 Rafting on the New and Gauley Rivers offers something for everyone, age six and up, from leisurely float trips to thrilling whitewater runs. River Expeditions headquarters features camping, rustic cabins, tents on platforms, RV Sites, The Red Dog River Saloon, outdoor pool and hot tub, Fire Creek Lodge & Conference Center, Outfitter Store, Dining Area, massage therapy, video arcade and more. River Expeditions is located at 900 Broadway Avenue Oak Hill WV 25901, in beautiful southern West Virginia, just 4 miles south of the New River Gorge Bridge.